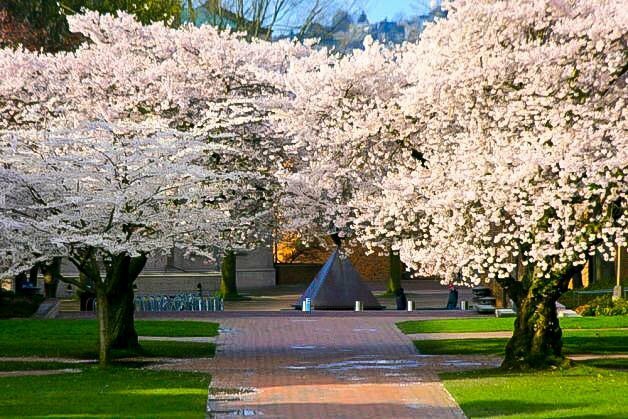 Nothing rivals the beauty of Japanese flowering cherry trees, and the Yoshino Cherry Tree is among the best and most-loved forms. 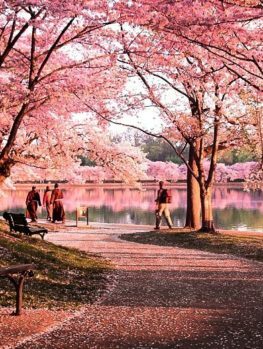 In mid-spring the branches are covered in large, shell-pink semi-double blossoms, and the effect is nothing short of spectacular. All summer the glossy, deep green leaves turn this tree into a beautiful shade tree for your garden, before turning gold and orange in fall. It has no fruit to stain driveways or patios, so it can be planted anywhere where you have enough room for its spread of more than 30 feet. 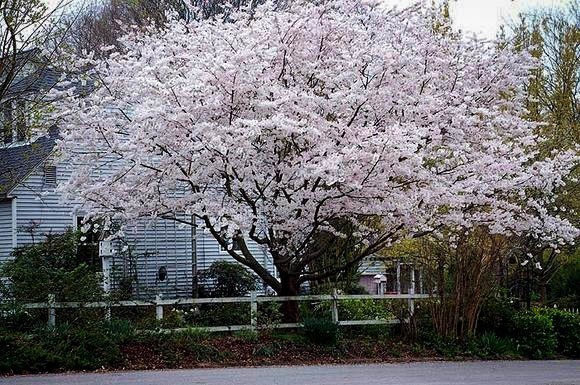 This fast-growing tree will soon amaze you and your neighbors with its beauty. Even in winter the handsome rich-brown bark and delicate branching catches the eye. Choose a sunny spot to plant your Yoshino Cherry Tree. This reliable tree will grow in almost any kind of soil that is not constantly wet, and it is a top choice for alkaline soils. 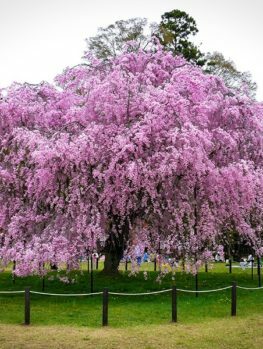 It normally needs no pruning to develop its beautiful broad, rounded form, but make sure you plant it with enough room to stay clear of surrounding trees and buildings. Mature trees are more than 30 feet across, so do not plant within 15 feet of any obstructions. It is more resistant than many other cherry trees to disease, so it usually remains healthy and attractive all year round. Flowering trees are a highlight in any garden – they bring color and interest at all seasons, but in spring they are especially welcome after the grey, cold days of winter. So a tree that bursts out with a profusion of blooms in the early days of spring will become a much-loved feature of your garden that will also please all who see it. 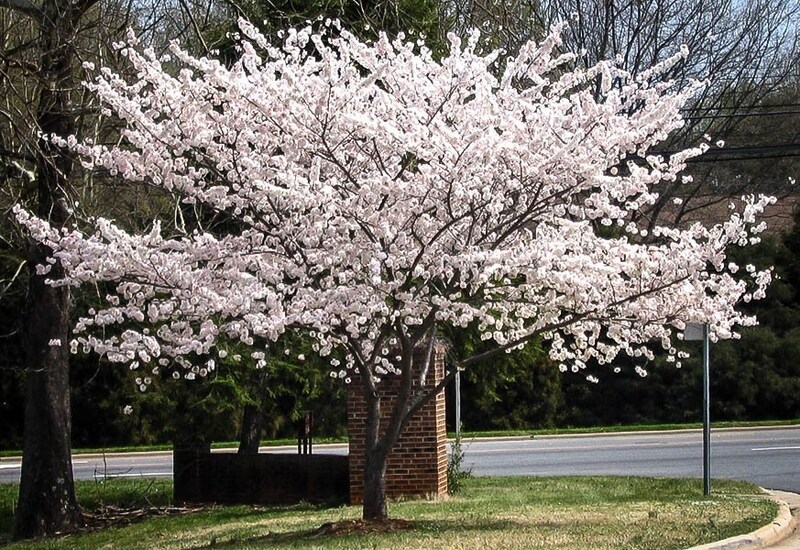 The Yoshino Cherry is one of the very best of the flowering trees for the spring and is a feature of many gardens and public spaces, most notably in Washington D.C. where (along with the Kwanzan Cherry) it is a feature of spring. 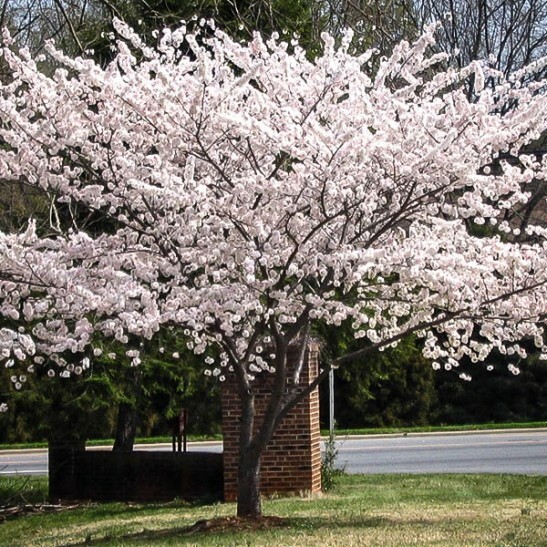 The Yoshino Cherry tree is hardy in zones 5 to 8, so it can be grown right across America except for the coldest and hottest regions. 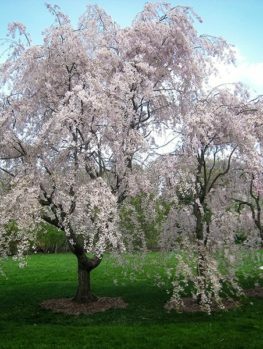 As a lawn specimen, planted as an avenue or mixed with other trees and shrubs around the boundary of your property, the Yoshino Cherry makes a great impact in spring and also in fall, when the leaves turn yellow and bronze before falling. The trunk and branches are an attractive deep reddish brown color and glossy, making for winter interest as well. 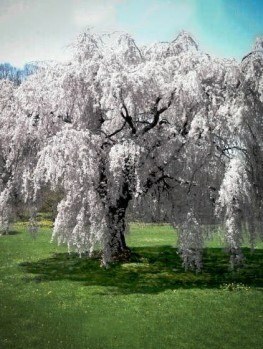 The Yoshino Cherry is quite fast growing; the branches can easily put on 2 or 3 feet of growth in a year. This means that in just a few short years you will have a 10 or 15 foot tree that will already be a feature of your garden. It will grow well in all kinds of soil, and will succeed and thrive in alkaline soils that other plants do not tolerate. Once established, it has reasonable drought tolerance and although it can be subject to some pests and diseases any work in controlling them will be amply rewarded with its marvelous flowering display every spring. The flowers are white or very pale pink but darker pink in the bud and on the back of the petals, so the overall effect in bloom is of a pale-pink cloud. Its appearance is even more dramatic because the flowers are born on bare branches. The leaves are oval and up to 5 inches long and they turn yellow and bronzy colored in the fall. The tree does bear a crop of small cherries around one half-inch across, but these are sour and have very little flesh. However they are very popular with birds and they will quickly clean the tree when the fruit is ripe. The bark is a rich, deep chestnut brown and is an attractive feature in winter when the dark branches are highlighted against a cold blue sky. This tree grows well from zone 5 to 8 and does best in soil that does not become too dry. It is a good choice for alkaline soils where other trees will not thrive but it will grow well in most types of soil, preferring loam or loamy-clay to sandy soils. When young it should be kept well watered and annual mulch with compost or other organic materials will be beneficial. In ordinary soil it will not usually need other fertilizing. When planting your Yoshino Cherry tree, choose a sunny spot and dig a hole three times wider than the pot it comes in. Add some organic material such as garden compost or rotted manure, if you can, to enrich the soil. Remove the tree from its pot and place it in the hole to the same depth as it was in the pot. Put back most of the soil, water well and after the water has drained away replace the rest of the soil. Water your tree well each week during the first year and after that during dry periods. This tree needs very little pruning, but remove any shoots that come from low down on the main trunk. Branches can be shortened back in winter to encourage a full, rounded crown. In the late 19th century, Americans started to travel to Japan and were amazed and impressed with the Flowering Cherry trees that abound in Japan. This encouraged an interest in growing these trees in American and in the early 20th century several thousand trees were given to America by Japan. They then began being planted in Washington DC. 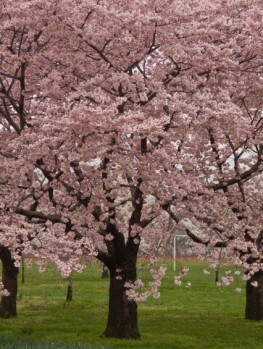 These original trees were mostly the Yoshino Cherry and the Kwanzan Cherry. 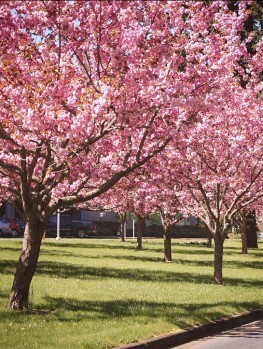 Over time more trees were added and the Washington National Cherry Blossom Festival became a feature of national life. So these trees link directly to both Washington and Japan and are a symbol of international peace and co-operation. The Yoshino Cherry is known botanically as Prunus × yedoensis and it is a hybrid created in the 18th century by Japanese gardeners from natural Japanese species of cherry. It is one of the most widely cultivated flowering cherries in Japan. It is a rounded tree that at maturity is between 15 and 30 feet tall or, exceptionally, even 40 feet tall. It has a rounded shape and is almost as wide across as it is high. 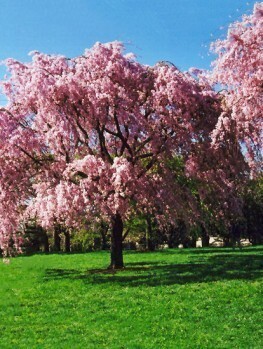 The Yoshino Cherry is a special tree that needs to be grown by grafting stems from known trees onto cherry roots. That way every tree is identical to the original and you can be sure that you are growing the correct tree. 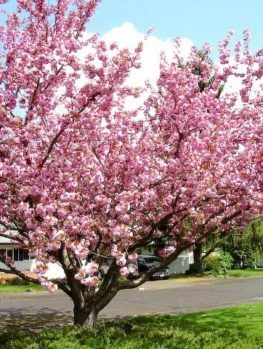 This take more time, so avoid cheap trees just labelled ‘Flowering Cherry’ as these will not be this famous and beautiful tree. We sell only trees that are true to the original form and we have a wide range of sizes to give you the best plant for your purpose. However we are constantly renewing our stock to ensure that our customers get fresh, healthy plants, so supplies of this tree may be limited. To avoid disappointment order now.